When it comes to the annals of biographical and quasi-biographical films, topics centering on the infamous ex-President, Richard Nixon is not exactly uncharted territory. However, the upcoming film, Elvis & Nixon will have something that all the other Nixons don’t have: Kevin Spacey. Now, the very first image has arrived of the House of Cards star as the embattled 37th Commander in Chief has arrived online, and from the look of things, he appears to be armed…with a finger gun! 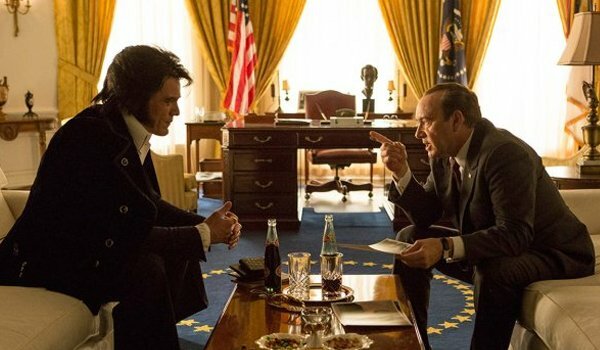 In an exclusive release by The Hollywood Reporter, we see a scene set in the Oval Office with Kevin Spacey’s grizzled and perpetually aggravated President RIchard Nixon sitting across a coffee table with an aged, bell-bottom rocking Elvis Presley - played by a heavily made-up Michael Shannon. As evidenced, the film will focus on the secret meeting between Elvis and Nixon which took place on December 21, 1970 in a move allegedly prompted by Nixon to have Elvis help reshape the President’s image among the young people of America, from whom he was becoming increasingly alienated. That's a rather hilarious idea in its own right, so we can probably conjecture a comedic twist will be featured in the film. The 1970 setting of the film presents a time when culture was experiencing an uprooting, as the poppy, twist-happy, "yeah, yeah, yeah" optimism of early 1960’s had transformed into a gritty bleakness that manifested itself in music and, most prominently, in the world of cinema - where realistic, pessimism-infused dramas like The Godfather and Chinatown would reign until Star Wars came around in 1977 and changed the landscape. However, don’t look for this film to be down in the dumps. While the film’s director, Liza Johnson is not particularly known for comedic romps, the film carries a historically quixotic plot which innately lends itself to some level of comedic absurdity (that thing about Elvis wanting an FBI badge isn't a joke). Plus, with names of lively talent like Johnny Knoxville, Colin Hanks, Sky Ferreira, Alex Pettyfer and Evan Peters listed in the primary cast, Elvis & Nixon will likely focus on the clearly humorous idea that an out-of-touch Richard Nixon, embroiled in the midst of the Vietnam War, with an emerging generation of counter-culture and mere months after the Kent State shootings would take THIS method of learning to be "down with the young people." Interestingly enough, this is not the first film to focus on this infamous meeting between the King of Rock and Roll and the King of Audio Tape. The 1997 made-for-TV film Elvis Meets Nixon (starring Rick Peters and Bob Gunton) actually tackled the same scenario, laced with the kind of off-the-wall silliness one would expect from a movie about Elvis trying to join (ironically enough,) the F.B.I.’s precursor to the D.E.A., the Bureau of Narcotics and Dangerous Drugs. 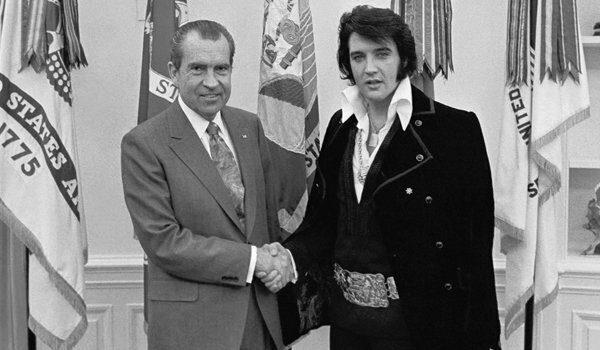 Likewise, Elvis & Nixon will probably embrace the absurd in a similar way - albeit with a WAY better cast. Elvis & Nixon looks to account for missing box-office earnings with a "Checkers" speech when it comes out later this year.